It’s a great weekend to be a Geek with some disposable income in the Circle City, my friends! 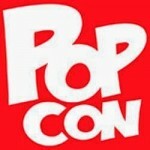 Starting tomorrow, and running through Sunday, it’s the 2nd year of Indy Pop Con! For those who weren’t familiar with their first show, here is my follow-up post for it, where I talked about things I liked, and things I thought could be improved on. For those who don’t want to go read it, though, I thought it was a great first-year con, put on by a great group of locals, that did have a few hiccups. This year, they have listened to their fan base, and their critics, and are doing their best to make their sophomore year a stellar year! They have an impressive guest list, that ranges from Hollywood starts like Edward James Olmos (Battlestar Galactica, Blade Runner), Sam Jones (Flash Gordon, Ted 2), Casper van Dien (Starship Troopers, Sleepy Hollow), and Peter Spellos (Men in Black II, Digimon), to YouTube stars like Markiplier, The Completionist, Jacksepticeye, and LordMinion777. There are also comic creators like Brooke A. Allen (Lumberjanes), Tony Moore (Battle Pope, Fear Agent), and more. Honestly? If you’re into comics, film making, YouTube, Podcasting, movie make-up effects, writing, cartooning, cosplaying, or pretty much anything having to do with Pop Culture, Indy Pop Con has probably brought someone in for it! In addition to all of these actors and creators, Indy Pop Con has a wide variety of other things to do! There is the Podcast Stage, hosted by Amalgam Podcast Network. Here, you can find many of the areas best podcasters, doing live recordings with the audience. Pop Con 2016 Goal: Get on that stage with Team Geeking! Also note: It’s going to be kicked off with a bunch of really awesome people, so you’ll want to check that out! There is also a lot of gaming! Not only do you have a section dedicated to board games, but you also have eBash sponsoring a computer and console gaming section, the Halo Championship Series, and the “Feet First into Hell” Halo ODST Drop Pod Simulator. You can also get behind the helm of a Starship using the Artemis Starship Bridge Simulator. Finally, they are encouraging the next round of awesome game makers with the Reboot Video Game Awards and the Young Game Developer Challenge! If you’re into costuming & cosplay, there is plenty for you, as well! With costuming workshops from “…and Sewing is Half the Battle” (see panel list, below), to photo opportunities, as well as cosplayers with tables that are more than happy to discuss their costumes, there is plenty for folks looking to play dress up! Plus, everyone’s favorite Star Wars costumers, the 501st and Rebel Legion, will have a table at the show, and on Saturday, will be doing their Droid Hunt! Black Hat/White Rabbit – Booth 526. Chris & Gin – Booth 826. FIGID Press – Booth 643. Geek Stuff off the Cuff – Booth 341. G Pike & Zombie Daisuke – Booth 424. Grimm’s Crib – Booth 629. Mike Makes Stuff – Booth 723. Obsessive Viewer Podcast/Blog – Booth 637. Pure Geekery – Booth 641. Tiny T-Rex Studios – Booth 323. Troy Brownfield – Booth 634. 5 PM – Webcomics Are Real Comics! 2 PM – Men in Comics Panel Now, let me pause here for a second. This panel is the product of a good number of my friends, including Team Geeking member Bri Rudd. 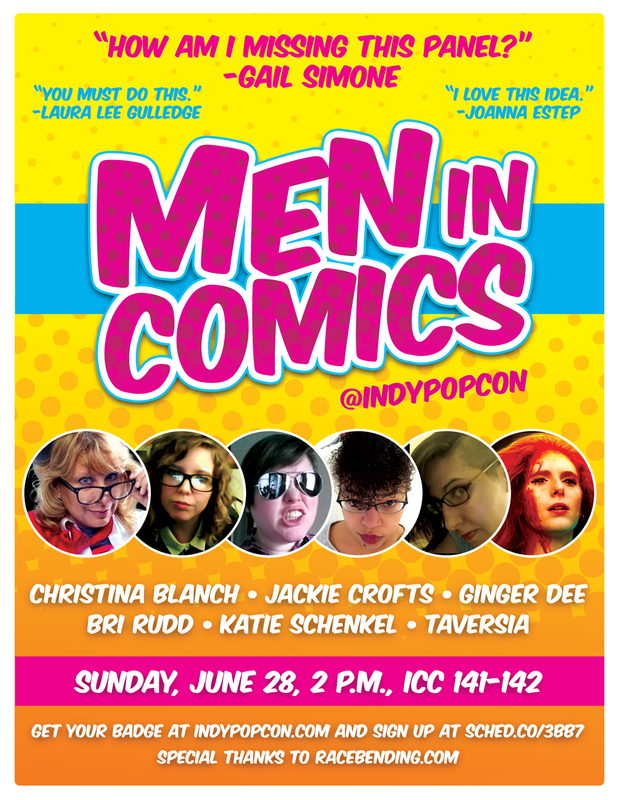 After Denver Comic Con had a “Women in Comics” panel with nothing but men, it was decided that, at Indy Pop Con, there needed to be a “Men in Comics” panel featuring nothing but women! 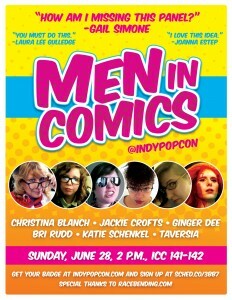 Come and check out this awesome group, as they talk about the struggles of men in the comics industry! Finally, all weekend, my good friends over at Crit Confirm Entertainment will be holding the Endless Dungeon in room 130. This awesome experience is done as a fundraiser for Extra Life, so not only is it going to be entertaining, but it will be for a good cause! Folks, I know I’m not hitting everything this con has to offer. Trust me, you want to go check it out this weekend! Visit their website for all of the information, and look for a blog post on Friday to tell you how to find the Team Geeking members in attendance! PLEEEEEASE make a recording of Men In Comics happen, and let me know where I can find it afterwards. I’m so sad I cannot be there. Good luck to everyone involved, you guys are going to rock it! Team Geeking–See you Friday night!